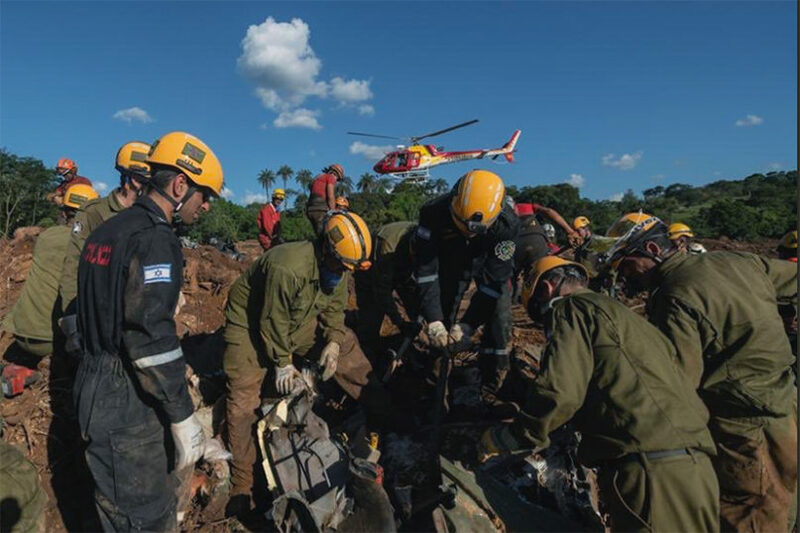 (JNS) More than 100 Israeli soldiers from the IDF Home Front Command who were sent to Brazil to help search-and-rescue teams hunt for hundreds of missing people will be returning home within the next 48 hours, having recovered at least 20 bodies, but finding no survivors. Approximately 60 hours after a dam belonging to the Vale ore-mining company collapsed and flooded Brumadinho, a team of Israeli soldiers, officers, engineers, doctors and rescue personnel arrived in Brazil to take part in the search effort. Israel was the only country to send a search-and-rescue team. The Israelis concentrated in areas believed to be heavily populated at the time of the dam collapse and resulting mudslide – a restaurant containing at least 140 diners, a bus transporting approximately 40 passengers, a minibus and a hostel. CAP: An Israel Defense Forces search-and-rescue team in Brazil, assisting in locating victims of the Brumadinho dam collapse. Source: IDF Twitter.